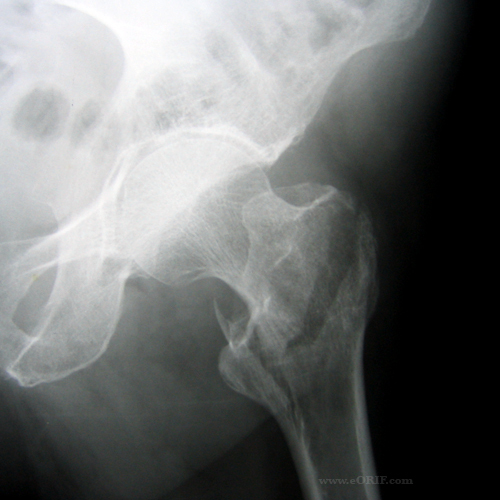 5% initial hopstial mortality, 12%-30% one-year mortality for all hip fracture patients. Mortality Risk Factors: age >85, lack of independent ADL's prior to fracture, poor nutrition, pre-op ASA class3 or 4, CHF, pneumonia. Stongest predictor = dementia. (Morrision RS, JAMA 2000;284:47), (Richmond J, JOT 2003;17:52). 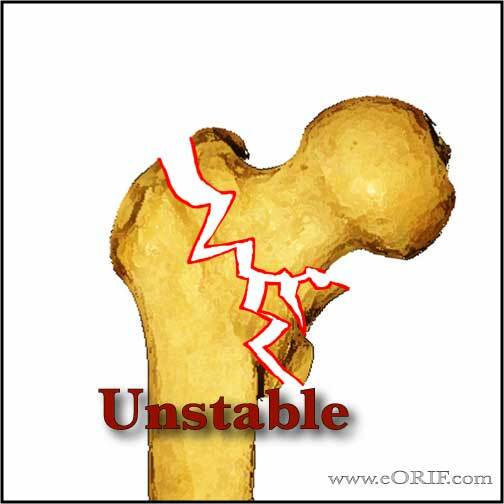 Elderly hip fractures are associated with low-energy falls and osteroporsis. 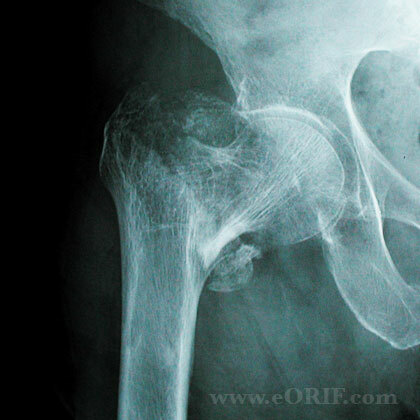 Hip fractures in young patients are associated with high-energy trauma (MVA, fall from height). Non-op treatment/delayed surgical treatment = decubiti, UTI, joint contractures, pneumonia, DVT/PE, high mortality rate. IT fractures occur between the greater and lesser trochanters. iliopsoas inserts on the lesser trochanter and flexes, externally rotates, and shortens the limb. Gluteus medius and minimus insert on the greater trochanter and produce varus deformity at the fracture site and shorten the limb. 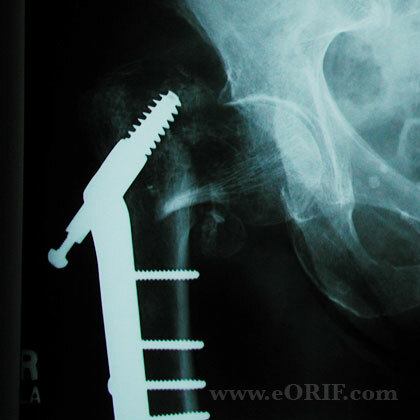 Hip adductors insert distal to the fracture causing adduction and varus deformity. Lower extremity is shortened and externally rotated with displaced fractures. Pain with any hip ROM. Document lower extremity NV exam. Document any pre-existing sacral or heel decubitus ulcer. AP pelvis, cross-table lateral hip, AP hip. 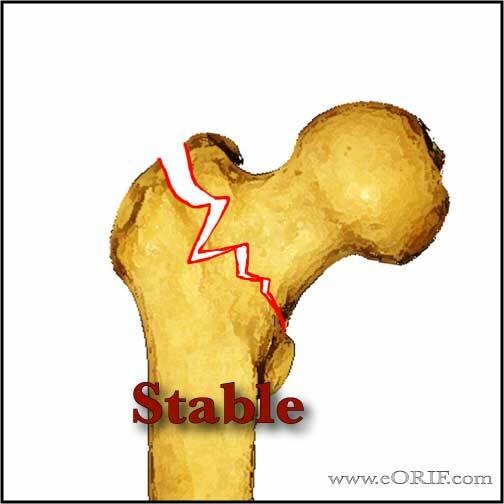 AP in 15° of internal rotation are best to demonstrate non-displaced fractures. Stable fracture (posteromedial cortex intact/minimal comminution): 2-hole DHS. Tip-apex distance shoulde be equal to or less than 25mm (tip apex distance = the sum of the distance from the tip of the lag screw to the apex of the femoral head on the AP and lateral Xrays) (Baumgaertner MR, JBJS 1995; 77:1058). Unstable fracture (posteromedial cortex comminuted, lateral cortex disruption, subtrochanteric extension): IMHS. Generally with long unlocked nail, unless there is subtrochanteric extention. Distal locking indicated for fractures with subtroch extention. Increased failure/complications rate. Patholigc fracture: long intramedullary nail. Preoperative skin traction in patients with hip fractures does not provide significant pain relief, as compared with pillow placement under the injured extremity (Rosen JE, JOT 2001;15:81), (Anderson GH, JBJS 1993;75Br:794) (Parker MJ, Cochrane Database of Systematic Reviews 2006;3:1). Regional anaesthesia: decreeased 1-month mortality and DVT compared to general anesthesia. GErnal anesthesia has reduced OR time. (Urwin SC, Br J Anaesh, 2000;84:450), (Luger TJ, Osteo Int'l 2010;21:555). 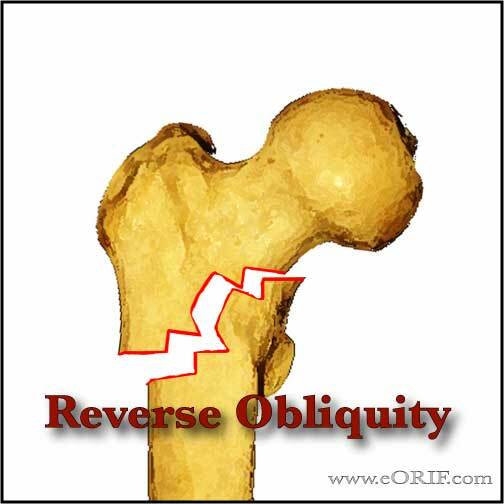 Elderly pts with fragility fractures should be evaluated for osteoporosis. Orthofix pertrochanteric Fixator (Moroni A, JBJS-AM 2005;87:753-9). Gotfried PCCP www.orthofix.com, percutaneous plating system. Head/neck/chest/abdominal injuries in high energy injuries. Kellam JF, Fischer TJ, Tornetta P III, Bosse MJ, Harris MB(eds): OKU Trauma 2. 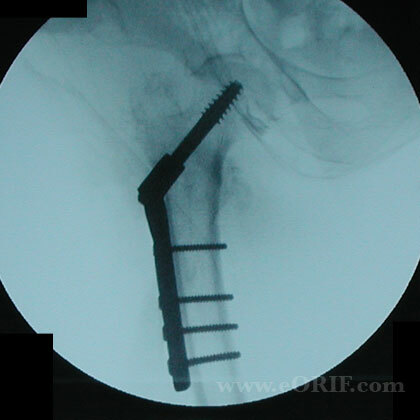 Rosemont, IL, AAOS, 2000, pp 125-131.